I've grown beyond the "tiny apartment" stage of life -- although readily acknowledge that it's a life that may embraced in the future. 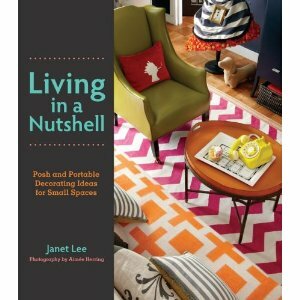 Maybe that's what made me pick up "Living in a Nutshell" by Janet Lee (Harper Design, $25). Or maybe I'm attuned to a trend recently noted in the Wall Street Journal about "do-it-yourself tiny homebuilding." The article noted various influences, yet inexplicably forgot Minnesota's Sarah Susanka, whose "not so big" ethic was among the first calls sounded against McMansions. Lee's book is subtitled "posh and portable decorating ideas for small spaces," and features more than 100 do-it-yourself projects for making spaces seem more spacious, for design that can be dismantled and moved to the next place, and for generally adding a welcome sense of humor to often-dreary digs. One of my favorite tips is screwing on a row of colorful C-clamps to the edge of an existing shelf, thus creating witty hooks on which to hang coats and umbrellas and whatever. Placing tiny felt upholstery pads on the inside of the swivel and the "c" protects the shelf from any dents -- always nice to get back that damage desposit! Another idea uses liquid starch to make cloth adhere to walls or cupboards. Lee says to roll the starch "the kind used for grade school craft projects" onto the walls with a sponge paint roller, layer on th e fabric, then finish with one more layer of starch to smooth out the lumps. OK, but here's what I'm most curious about: She says you can simply peel off the fabric without a trace when it's time to move, or you want to change the look. Really? I'm trying it in the basement bathroom first. While there are a few mirrors in the book, they are few - a happy change from that old room-expanding trick. Indeed, many of the projects aren't so much about making a small space seem roomier as they are about making a featureless space look attractive. Some of these are more geared to people who own and small spaces, or are willing to assume the costs of restoring the place to its original condition. Consider the idea of painting a boring, standard issue door with chalkboard paint, then drawing on cornices and roman columns -- or whatever architectural style you want to invoke. Quoting Andy Warhol: "Art is whatever you can get away with." There's a simply brilliant idea for a window shade that uses a fitted sheet. The elasticized edge is what creates a chic balloon effect when the sheet is hiked up with some ribbons.There's also an unexpected chapter with decorating ideas for a child's room. Lee also has a website, www.livinginanutshell.com. Whether you reside in the equivalent of a coconut or a hazelnut, there may be an idea for you.